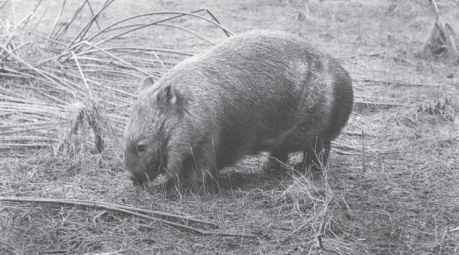 If there are suitable tussocks of some of the grasses favoured by the wombat in the vicinity of the burrow, it may graze there for some time, but more often it moves right away from the area, grazing occasionally as it goes, until a chosen feeding place is reached. The location of this will vary, of course, with the seasons and the climatic conditions, and which grasses a wombat will choose depends on what is available at that time (Figure 5.8). 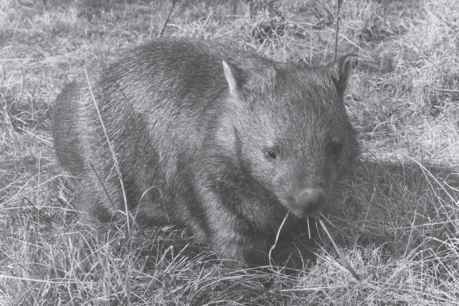 John McIlroy's study in the Brindabella Mountains near Canberra showed that bare-nosed wombats prefer the coarse, high-fibre grasses. He found that several species of Poa, or tussock grass, were the plants most commonly eaten in the forest areas, while in the open, more pastoral country kangaroo grass (Themeda australis) and wallaby grass (Danthonia penicillata) were the favourites. Oats (Avena sativa) growing in a newly planted pine plantation were favoured by a few wombats. Tall sedge (Carex appressa) and spiny-headed mat-rush (Lomandra longifolia) were also eaten at times. Figure 5.8 This young bare-nosed wombat is eating the young shoots of weeping grass on a recently dry swamp bed. When following bare-nosed wombats closely while they are feeding in the local coastal forest in East Gippsland, I have noticed that they eat a wide variety of plants, all monocotyledonous (i.e. 'having one seed leaf'. Monocotyledons have long parallel-veined leaves). The most favoured grasses are spear grass (Stipa sp.) and fine tussock grass (Poa sp.). Kangaroo grass, elsewhere a major food item, is not common in this forest, but small patches of it do occur, and these are popular with wombats. Other grasses that are eaten from time to time include weeping grass (Microlaena stipoides) and reed bent grass (Deyeuxia quadriseta); the new tips of forest wire grass (Tetrarrhena juncea) are relished in the spring. Several species of sedges (Carex sp. ), rushes (Juncus sp. ), club-rushes (Scirpus sp. ), mat-rushes (Lomandra sp.) and several other plants that I have been unable to identify are all part of the coastal wombat's diet, as are some of the introduced grasses in the area, such as paspalum (Paspalum dilatatum) and parramatta grass (Sporobolis africanus). At the western extreme of the bare-nosed wombat's range, in the dune country of the Coorong and Messent National Parks in south-eastern South Australia, Katy Mallett and Brian Cooke investigated the diet of the wombat by analysing wombat scats. They found that the bulk of any individual wombat's diet appeared to be made up of two or three plant species, although the species varied between wombats and seasons. In any season most of the diet consisted of only a few plant species: Australian salt grass (Distichlis distichophylla), perennial rye-grass (Lolium perenne), spear grass (Stipa sp. ), tassel rope-rush (Hypolaena fastigiata), wire rapier-sedge (Lepidosperma semiteres), hair-sedge (Tetraria capillaris), some herbaceous material and several unidentified grasses. The bulk of the northerns' diet consists of four species. Andrew Woolnough studied their diet and found that it was composed of three-awned grasses (Aristida spp. 35%), bottle-washer grasses (Enneapogon sp. 28%), the introduced Buffel grass (Cenchrus ciliaris 27%) and 4% was the sedge (Fimbristylis dichotoma). Figure 5.9 Leaves of coarse grasses such as kangaroo grass or spear grass may be jerked free of their leaf bases. that the leaves are either broken off or else pulled cleanly from their axils or leaf bases (Figure 5.9). On the sides and floors of the gullies a wombat often pauses to sample some of the larger rushes and sedges, including thatch saw-sedge (Gahnia radula), more aptly known as sword grass. The razor-sharp leaves of this plant have long white bases which are apparently a wombat delicacy, but the green part of the leaf also is sometimes eaten. A wombat pulls the sword grass leaves free from the base of the plant by biting a leaf near its base, carefully arranging it in the mouth and then giving it a sharp, sideways, upward tug. If the leaf does not pull free the first time, the wombat jerks its head again and again until it does. Usually only the white part of the stem is eaten, the rest being grasped in a front paw and discarded. Wombats are remarkably dexterous with their front paws and often use them to rearrange stems or to remove from their mouths any stems they do not wish to eat. In this grasping action, all the digits are bent over so that the claws are touching the pads on the palm of the paw. The young seed-heads of many species of grasses are also sometimes consumed by wombats, the dexterous front paws frequently being used to remove unwanted stalks from the mouth. 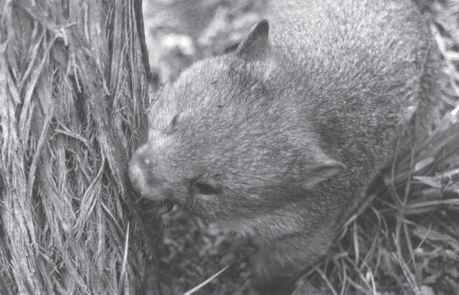 Figure 5.10 Occasionally a wombat will tear strips of bark from tree trunks. From time to time when it is eating grass, a wombat will deliberately select and eat dry leaves and stalks, and occasionally it will tear a strip of bark from the trunk of a tree and chew small quantities of it, but much more is usually torn off than is actually eaten (Figure 5.10). The bark probably serves mostly to keep the teeth in trim, and it is usually trees with a fibrous type of bark that are chosen for this purpose. Low-growing and fallen twigs and branches are also frequently gnawed in order to keep the ever-growing teeth sharp and at their proper length. Burnt logs and sticks are often nibbled, and some of the charcoal is crunched up and eaten. When it is digging a burrow, a wombat often uncovers roots, both large and small, and it bites them off sharply or chews the larger ones, in order to remove them from the tunnel, but it does not appear to eat any of this root material. Other observers have recorded the roots of various trees such as stringybarks, and of plants such as mat-rushes and Poa grasses, being dug up and eaten. Sometimes, particularly during drought or other times of scarcity, it will scratch away the surface soil to uncover small roots of grass and other plants, which are nibbled off (Figure 5.11). In some parts of their range, southern hairy-nosed wombats dig over large areas to uncover the corms of nut grass (Cyperus rotundus), which forms an important part of their diet, especially during droughts. 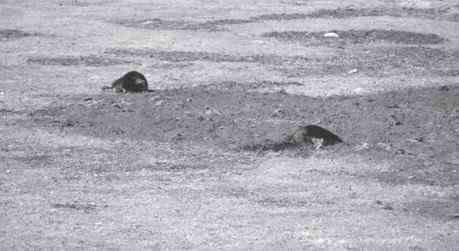 Figure 5.11 In times of drought, bare-nosed wombats will scratch away the surface soil to uncover small roots, which are nibbled off. Mat-rush leaves are an important food item in all parts of the bare-nosed wombat's range, including those parts which are covered in snow in winter. Digging being no problem to a wombat, it simply scoops out a hole in the snow until it reaches a suitable plant. Ian Pulsford observed a wombat digging on a snow slope in the Kosciuszko National Park. It had dug through 30 centimetres of snow to reach mat-rush leaves, which it pulled out and ate hungrily (see Plate 13). 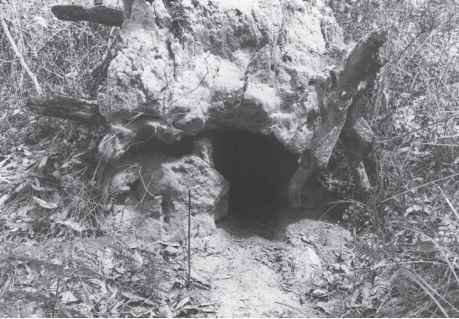 Several other holes scattered over the same slope indicated that this was a regular feeding method. In a very different habitat, the sand dunes on the southern Victorian coastline, Martin Schulz observed bare-nosed wombats eating marram grass (Ammophila arenaria) and hairy spinifex (Spinifex hirsutus) (see Plate 7). Moss appears to be a wombat delicacy, the soft green varieties that grow on fallen logs and branches being gnawed off with apparent relish (Figure 5.12). Some species of moss that grow among damp grass are favoured when they are green and moist, but generally ignored when they are drier. It is possible that mosses are eaten for their water content as they have little nutritional value. Figure 5.12 Moss growing on a fallen log appears to be a wombat delicacy. growing mushroom, a wombat would take one large bite out of it and walk on, chewing as it went. These and other fungi are often found with similar bites taken from them, but wombats are not always responsible - I have also observed swamp wallabies eating fungi. 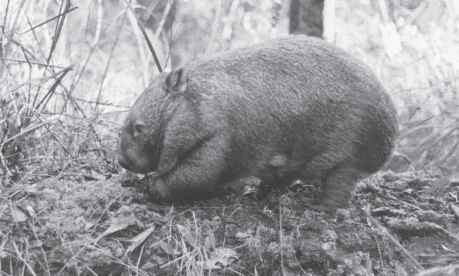 Does the southern hairy nosed wombat eat Dwarf Lomandra Plants? What not to feed wombats? What kinf of mushrooms wombats eat?